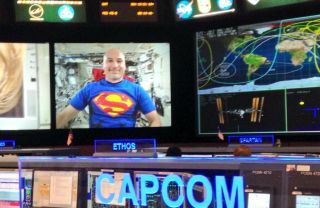 European Space Agency astronaut Luca Parmitano dressed up as Superman in honor of Halloween. Image released Oct. 31, 2013. It's Halloween on Earth, but at least one astronaut on the International Space Station is celebrating the spooky holiday from orbit. European Space Agency astronaut Luca Parmitano dressed up like Superman while speaking to NASA ground controllers today (Oct. 31). David Saint-Jacques, a Canadian Space Agency astronaut, snapped a photo of Parmitano in full super hero regalia and posted it on Twitter. The Canadian Space Agency translated Saint-Jacques' post (@Astro_DavidS) from French to English: "@astro_luca [Luca Parmitano] dressed up [for] Halloween," the CSA's (@csa_asc) translation reads. "Wonder if the cape helps him fly better aboard #ISS!"